In the previous weeks, we have provided you tips on how to write that killer headline for your emails. You might ask if those will also work for social media posts? Certainly. But here’s a lot more information to get your followers hooked on that first glance. 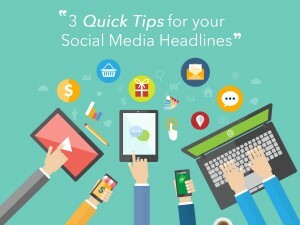 Social media headlines act as your bait to keep the readers wanting for more information on what you want to say. And because of the speed of activities going online, you also compete with their attention span and the rest of the posts being flooded in their timeline. Have a listen now and learn how you can make use of these pointers for your next update. 00:33 What are the specific things you can do to pump up your headline? 01:08 People like justifying things and how can you use numbers in the headline? 01:34 Do you know that even numbers have negative effect? 02:27 How can you know what your customers like?